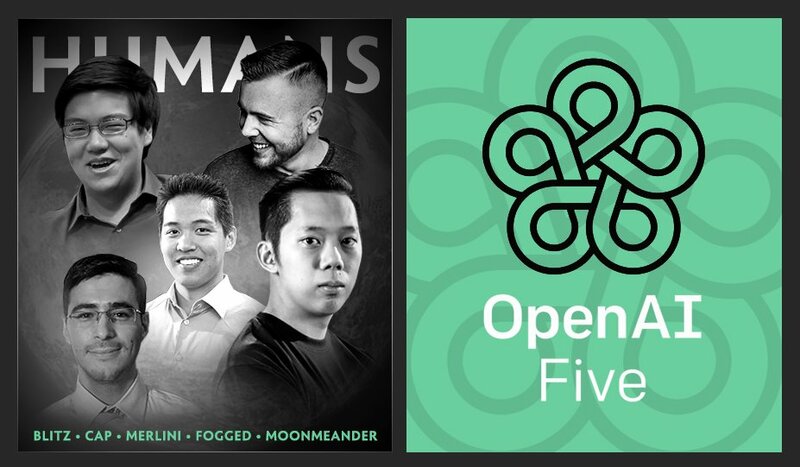 The OpenAI Five team made a fantastic display of their intimidating strength in the show-match today against some of the best players in the world, including a Major-winning professional player, to come out on top with a clean 2:0 victory. As part of the Five Benchmark being conducted to test their strength, the OpenAI bots competed against a team of highly skilled humans who fall in the 99.95th percentile of all players in the world. The team consisted of high-ranked, popular analysts and casters from the English-speaking community of Dota namely Blitz, Capitalist, Fogged, and Merlini. Some of them have also had a brief stint in the professional scene in the past. Joining them was none other than two-time Major winner David "MoonMeander" Tan who currently plays for compLexity Gaming. The event started off with the audience match as a sort of warmup for the OpenAI Five before the big match. The result was surprising for most of the audience new to witnessing these bots in action. They completely annihilated the amateurs by taking down two lanes of barracks in just about 13 minutes, an astonishing feat. Clearly, the human team had no chance of turning the game around and called the 'gg'. Several of the restrictions applied on the bots had been removed prior to the showdown. However, the restrictions of an 18 hero pool, no bottle, and no Divine Rapier stayed. Also, each player on both teams had a personal courier of their own. Game 1 started very well for the bots right from the start. They used their advantage from the laning phase to push down towers as a force of five very quickly. Without feeling the need to go Roshan and collect the Aegis, they took down the first lane of barracks very early in the game. Capable of making close-to-perfect decisions on the spot, they were able to punish any hero that stepped even a little out of their safe zone and capitalized on potential kills. Game 2 was much closer, with more favorable odds for the humans at several points in the game. Team Humans managed to get more kills, but also did not avoid feeding some of their own every time. Eventually, the net-worth advantage for the bots racked up once again, and they were able to take down lane after lane of barracks with their incredible sustainability. The humans held on to the bitter end, till the very last lane of barracks had been destroyed and they had no buybacks to spare. They called the 'gg' to concede their second game in a row and the series as a whole. For the sake of the audience and over 70,000 people watching on the live stream, the organizers decided to play the third match anyway. This time, the OpenAI team were so confident that they allowed the audience members and viewers in the chat to decide the heroes for the OpenAI Five lineup. With a greedy, all-core draft chosen deliberately to put them at a disadvantage, the bots fought long and hard. However, the odds were against them, as they continued to state in all-chat, which were the lowest they had encountered against any human lineup they had faced before. Fortunately, the human team was able to leave with some dignity at having beaten the OpenAI bots in the third match, despite losing the series overall. There were many interesting questions asked before and after the show-match to the various programmers and employees working for OpenAI. It was stated that the purpose of the bots was not simply to defeat players at the game of Dota 2, but to help design AI that can be applied to solving real-world problems. This is why Dota 2 was selected as the game of choice due to its complexity, limited information perception and requirement of teamwork. Furthermore, as shown in the video below, it was revealed that the same form of AI used for playing Dota 2 was used to control a robotic arm to imitate human movements. This is a revelation in the field, as few have been able to achieve what this open-source project has been able to accomplish with the help of AI. It marks an exciting time in the development of this field and makes us wonder what more is in store for us in the future. Do you think the OpenAI Five can beat the best professional players in the world? Yes, piece of cake. The era of humans is coming to an end. No, not a chance. Put them up against TI8 winners, then see. Just logged in after a year of absence from this site to say that it was all Fogged's fault, all i saw from him was feeding, but correct me if i was blind! Circumstances were still fairly restricted, it will be long-long til they can repeat that in a "standard" game!